Southwest, which focuses primarily on travel within the United States, cancelled 9,400 flights in the first quarter, with the Boeing grounding accounting for about a third of that number, the company said in a securities filing. The disclosure highlighted the hit from the Boeing debacle to US airlines following a Federal Aviation Administration order on March 13 after two deadly crashes involving the aircraft. Larger carriers American Airlines and United Continental have also signaled a likely hit to earnings resulting from cancelled 737 MAX flights. 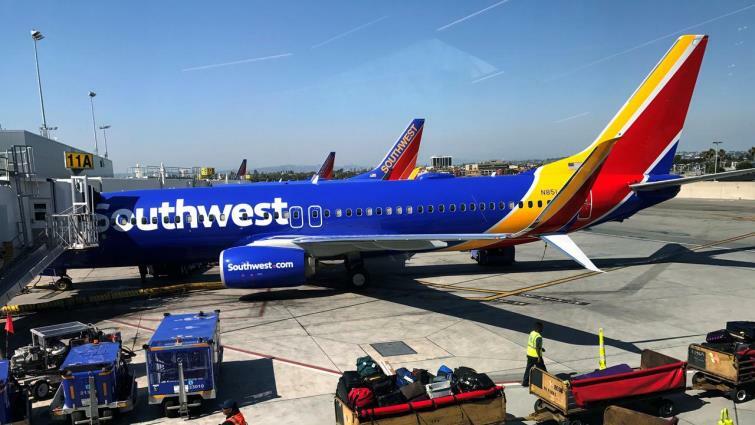 About 40 percent of Southwest’s flights were cancelled due to weather, with the remaining 30 percent resulting from maintenance disruptions connected to talks with a mechanics union. In total, these cancelations will result in $150 million in lost revenues in the first quarter, on top of the previous hit of $60 million due to lost business from the government shutdown, the airline said. Despite the hit from the cancelled flights, shares of Southwest and other US carriers rose Wednesday after Southwest described solid consumer demand. Dallas-based Southwest has grounded all 34 of its 737 MAX 8 aircraft and also has 41 remaining MAX deliveries scheduled in 2019, with more than 300 orders and options beyond this year. “Due to the current uncertainty regarding the duration of the MAX groundings and any requirements for reinstatement of the aircraft into service, it is difficult for the company to forecast the impact of the MAX groundings beyond first quarter 2019,” Southwest said. United Continental said in a March 15 filing that the FAA grounding, which affected about 40 flights per day, had not yet significantly impacted financial performance. “However, the financial and operational impact to the company is expected to increase if the grounding extends into the peak summer travel season,” United said. Shares of Southwest rose 1.9 percent at midday to $49.66, while American gained 2.3 percent to $30.90 and United 1.2 percent to $78.45. Delta Air Lines and Jet Blue, two carriers that don’t fly the 737 MAX, also rose. The gains came as the broader S&P 500 fell 0.7 percent. CFRA Analyst Jim Corridore said investors welcomed the detail from Southwest on costs of the 737 MAX grounding, as well as its description of a solid demand environment. Southwest trimmed its estimate for revenue per seat mile, but still forecast two to three percent growth in the first quarter compared with last year. It also said it expects “strong” growth in the second quarter. Carriers that do not fly the MAX “will benefit from the demand environment Southwest mentioned,” Corridore said. US carriers are scheduled to report first-quarter earnings in the latter half of April. The post Southwest cuts sales outlook as 737 MAX grounding hits US carriers appeared first on SABC News – Breaking news, special reports, world, business, sport coverage of all South African current events. Africa's news leader..